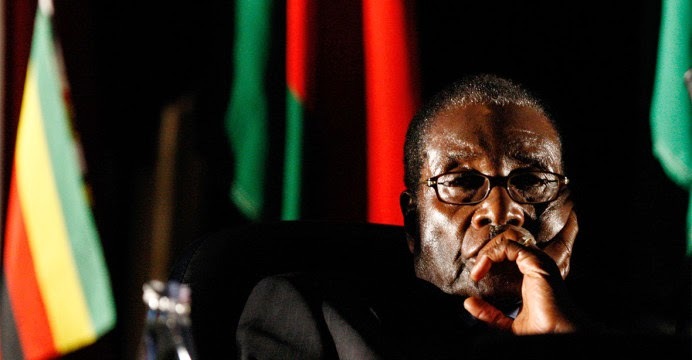 HARARE – President Robert Mugabe yesterday came face to face with the reality many people are enduring on a daily basis when a politburo meeting he was chairing was aborted after a blackout in Harare which also affected Zanu PF headquarters. The nonagenarian was given a stark reminder that away from the factional fights Zanu PF is involved in, there are more pressing economic issues to be resolved. Such has been the destruction to the economy while Zanu PF heavyweights concentrate on fights for power that social service delivery has virtually collapsed with people going for years now without adequate water and electricity among others. As a result of the power cut, the meeting was called off with party spokesperson Rugare Gumbo saying they tasked energy minister Dzikamai Mavhaire to look into the matter. “We told Mavhaire to address this,” Gumbo said. Embarrasingly, the party functionaries at the headquarters failed to switch on the generator leaving the top echelons of the party, including Mugabe, stranded in total darkness. After waiting for more than 25 minutes in the dark hoping that electricity would be restored, the party’s top cabal decided to call off the meeting. However, they could not immediately leave the boardroom where the meeting was taking place as they dreaded descending from the 14th floor to the ground using stairs, especially for the 90-year-old Mugabe and other others like Cephas Msipa who are very old. Ironically, Mavhaire and Zesa Holdings (Zesa) chairman Herbert Murerwa were both present at the politburo meeting. Mugabe has presided over the demise of the Zimbabwean economy which has seen service delivery deteriorate to unpalatable levels. Closeted at his Borrowdale plush mansion, Mugabe has never experienced the problems that Zimbabweans face as he receives five-star treatment with electricity in full supply throughout. However, ordinary Zimbabweans have to make do with more than 18 hours of load-shedding on a daily basis. In the past few months, the country’s sole power utility — Zesa — has increased load-shedding. The outages, known as load-shedding are affecting homes, businesses and industries across the nation. Only major hospitals and strategic facilities are being excluded. Zimbabwe’s economy, which showed signs of improvement during the government of national unity between 2009 and 2012, growing by an average of seven percent, is slowly receding with this year’s gross domestic product growth having been revised further downwards from the initial five percent to 3,4 percent. Also, Zimbabweans have to contend with incessant water cuts that have seen some families drilling boreholes at their houses. To add on, there is shortage of medicine in public hospitals leaving impoverished citizens in dire straits.